﻿We did it! Hope's skeleton is together (at least for now). There are a very few finishing touches for the next week, but the big stuff is done. Deanna spent many hours this week working on recreating one of Hope's pelvic bones. That's right, she has a pelvis! We had her right pelvic bone but had to recreate the left one. Then came the several days of research and head scratching to find the final postion to mount them. Come by to see what we decided. 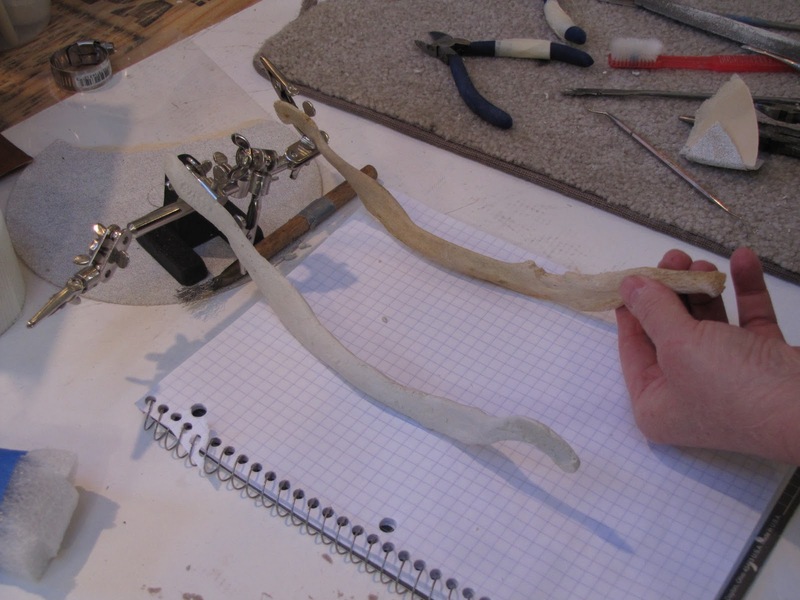 Hope's orginal pelvic bone on the right and the recreated one﻿ on the left. 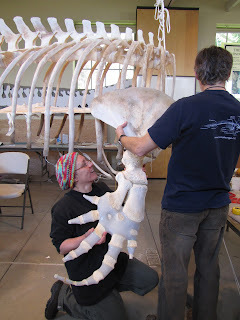 Next came the task of placing the scapulae and flippers. 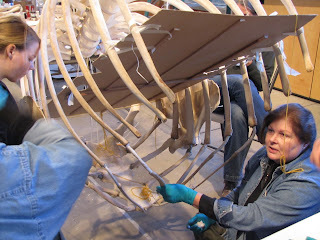 Again we scratched our heads, looked at lots of photos of swimming, diving and breaching orcas, moved the flippers and scapula to different postions and rotated the flipper to make sure it would be anatomically correct. We decided on a position that fits perfectly with her graceful diving position. We also put some finishing touches on the rib cage to make sure it would be strong enough to stay in the position we carefully worked on last week and to hold the weight of the scapulae and flippers. We used epoxy clay to add strength to the all-thread pins and then covered the epoxy with clear silicone to match the vertebrae. Heather, Linda and Chris molding the epoxy clay. 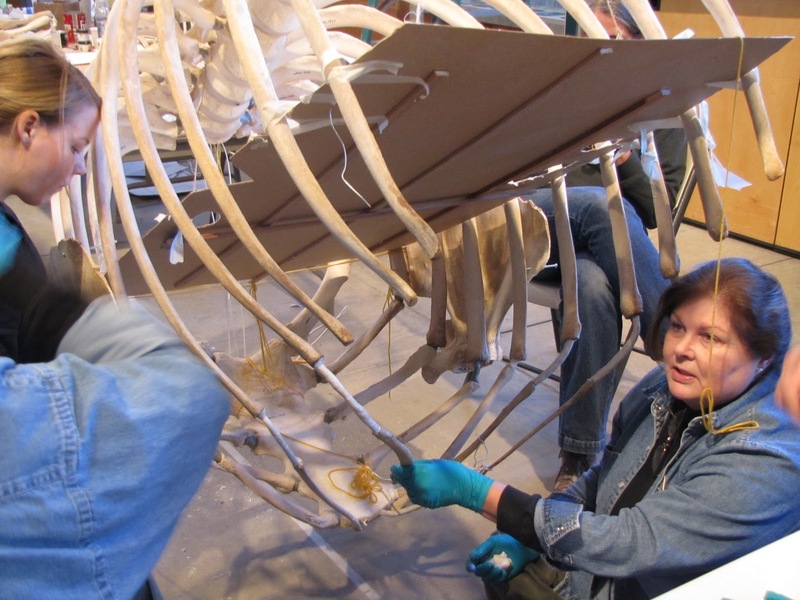 Becca worked hard to weld and custom fit the cradle that will safely hold Hope's 80 pound skull in position. This required several trips back and forth to her shop for "fitting sessions". 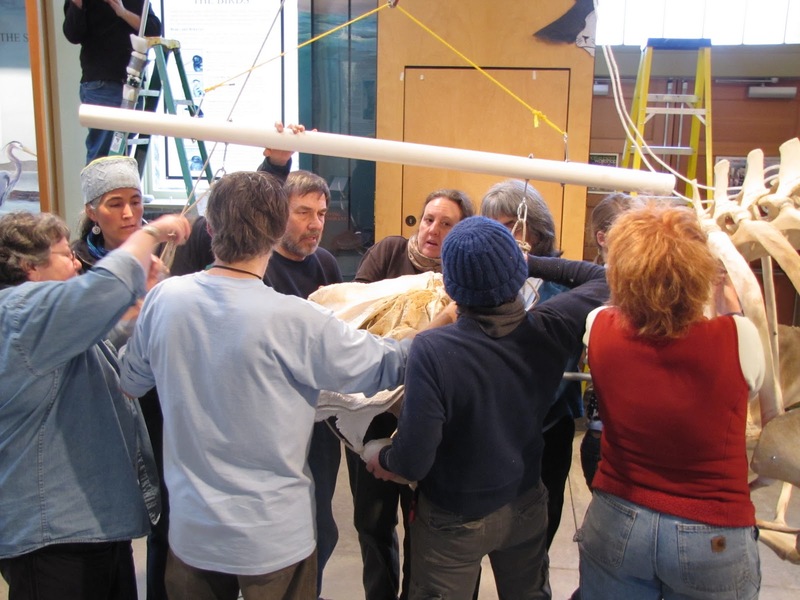 Then the cradle was painted and padded before being secured to her skull with a one inch all-thread rod. 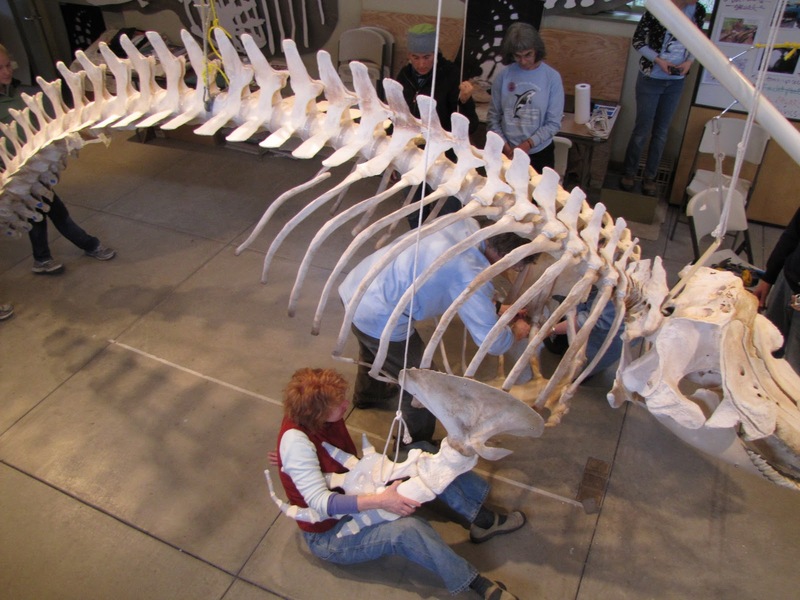 Some of the last bones to be attached to the skeleton are the v-shaped chevrons beneath the tail. 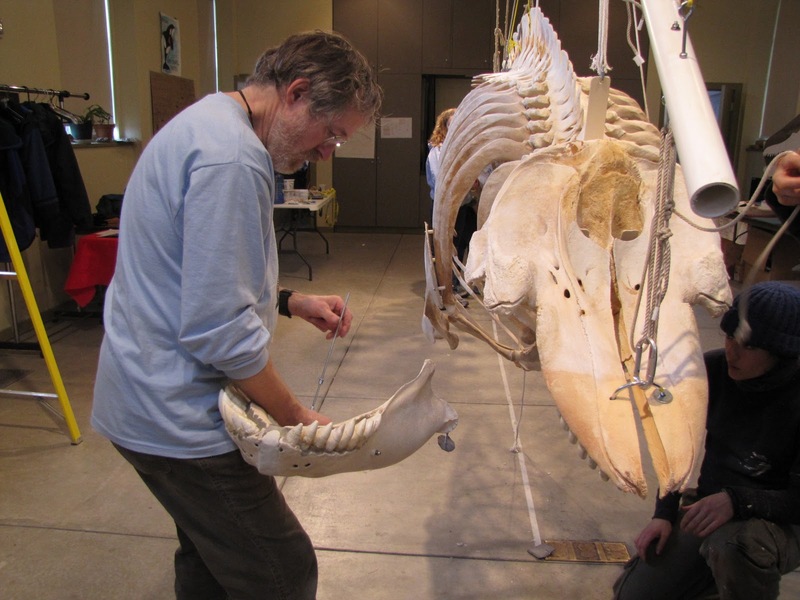 Watch the video below to see how Eliza and Chloe recreated this unique piece of orca anatomy. 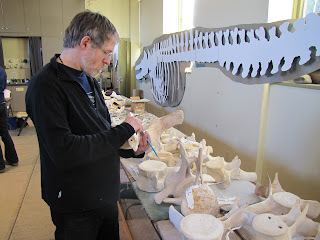 Before we could try mounting the skull, the last vertebrae needed to be drilled. The cervical, or neck vertebrae are some pretty interesting bones. 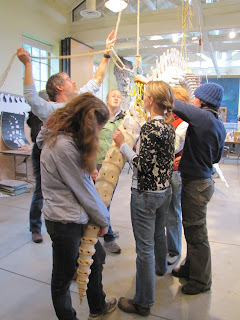 The seven vertebrae are fused into two sections, making them a bit tricky to drill. We arrived Friday morning to a highly motivated Lee Post, who quickly had us ready to mount the skull. 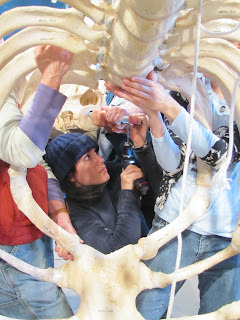 It took twelve people for this first effort, mainly because we had to drill the hole where the set screw inserts into the all thread rod holding the skull in place--and because we were kind of nervous! 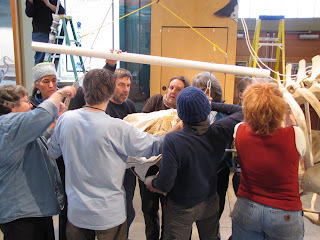 Seroius faces as we manuver the skull into position. ﻿Becca drills the hole for the set screw. Lee prepares to attach the mandibles. 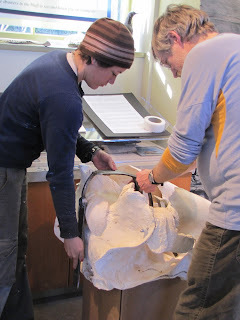 After we attached the skull (and let out our breath) we attached the flippers to the scapulae. Sue and Linda represented "team flipper" by gently guiding each of them into place while Lee set the screws that hold them securely. Sue holds the right flipper while Lee and Linda attach the left flipper. The rope adds support. We were on a roll and the next step was to insert the tail piece. 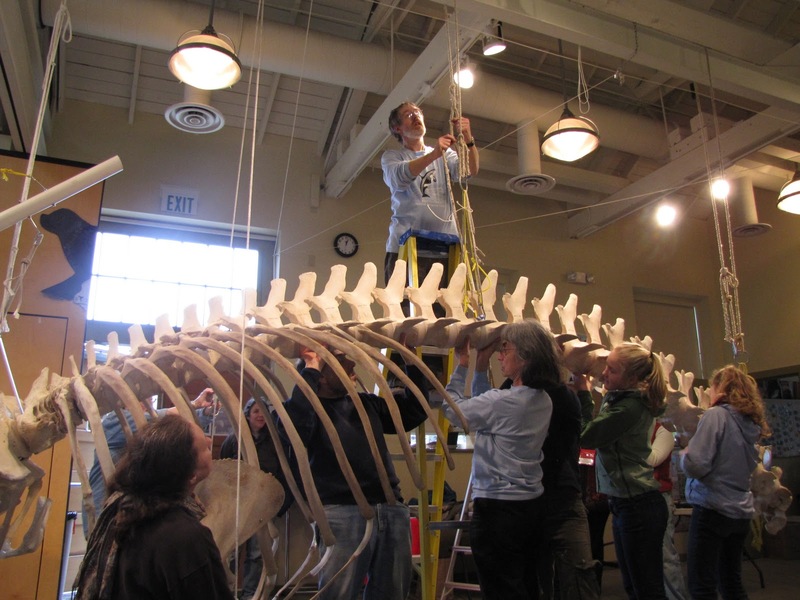 Before we could do that, we had to raise the whole whale a few inches so that the tiny bone on the end of the tail couldn't hit the hard floor. The tail piece inserted smoothly with another set screw to hold it in place. More adjustment to the hanging ropes made sure Hope stays balanced and secure. Eliza, Lee, Chloe, Heather, Becca and Sue hold the tail in place. It took alot of volunteers alot of hours to put Hope back together. 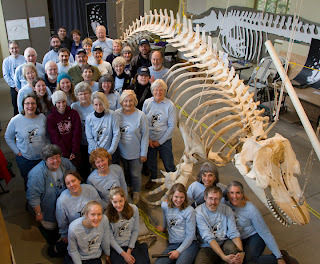 Here are almost all of us with this beautiful whale! ﻿For those of you who haven't heard the news, Hope's skeleton will be stored in sections throughout the Natural History Exhibit and classroom for the time being. Although it will be a while before we are able to build her a home, we are glad her presence will remain here. Learn more about our capital campaign to build Hope a home HERE. We knew the time would come when Lee had to return to his life as a book seller in Homer, Alaska (and author of really cool bone building books found at his website theboneman.com). We will miss his smile, enthusiasm, and amazing ability to get everyone involved in this project. 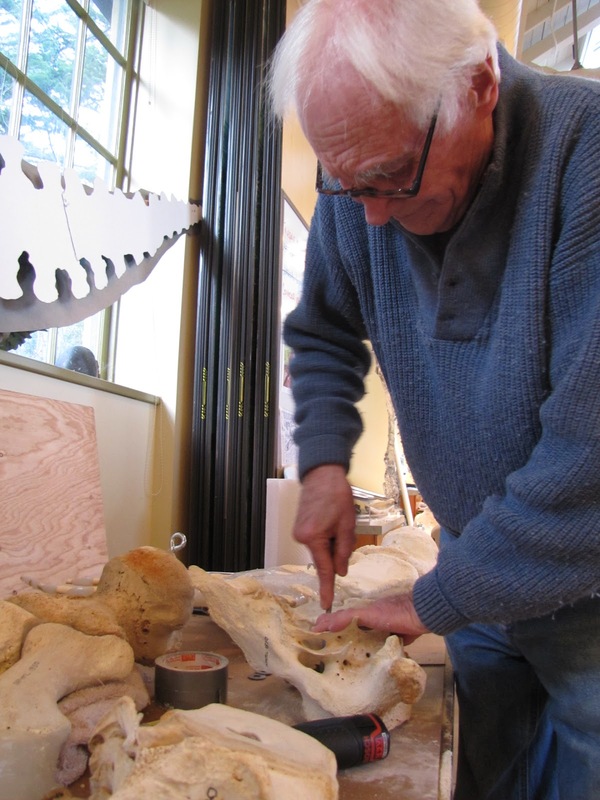 We appreciate his kind and gentle guidance as we turned this table full of bones into a beautiful whale. Lee has become a part of the PTMSC family, so he can't stay away for too long. In fact, he's already dreaming up new projects for us!